Has Gerard Doherty played his last game for Derry City? DERRY CITY skipper Gerard Doherty looks set to sensationally leave his home town club. 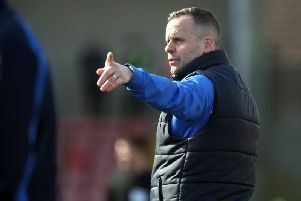 The Journal understands the Creggan man’s relationship with boss Kenny Shiels has broken down to such an extent that he hasn’t been at the club since Wednesday morning. Doherty, who’s testimonial celebrations conclude at the Maldron Hotel tomorrow night, is believed to have held talks with Shiels prior to training on Wednesday morning. He left after that meeting and will not be involved in this evening’s encounter at St Patrick’s Athletic. The 37-year-old, who missed Monday night’s defeat at Bray Wanderers - Derry’s 19th league loss of the season - refused to comment on the situation when contacted but it’s believed he’s currently considering his future. As recently as September, Doherty signed a new contract to remain with Derry for the 2019 season and this uncertainty will only adds to a disappointing end of season at Brandywell Stadium. Candy Stripes boss, Kenny Shiels, failed to deny the rift but wouldn’t be drawn on the speculation that his keeper and captain was considering leaving the club. “Gerard has signed a new contract in the last couple of months,” stated Shiels. Following Monday night’s 2-1 defeat at the Carlisle Grounds, Shiels claimed Irish League teams were eyeing his squad and Danske Bank Premiership champions, Crusaders, are believed to be monitoring both Doherty and midfielder Rory Hale. “You’ve probably heard the rumour that another player may be going to the Irish League from our club,” stated the Derry boss.